Deputy Chairman of the Majilis Vladimir Bozhko with the deputies visited the Khorgos. 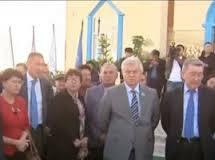 Deputies examined ICBC "Khorgos", FEZ "Khorgos - Eastern Gate" as well as the last construction of 300-kilometer section of the international transport corridor "Western Europe - Western China" - the highway Almaty - Khorgos. Majilismen highly appreciated the dynamics of the growth of cross-border traffic and the development of related infrastructure.